The most effective approach to sharply reducing the legacy of Agent Orange in Vietnam is to focus assistance to health and disabilities services in the provinces which were heavily sprayed with dioxin and on clean-up of dioxin hotspots at former U.S. military bases. To highlight these areas, we employ the great amount of historical data available from Jeanne Stellman and her colleagues at Columbia University on the areas that were sprayed with herbicides and more recent data on dioxin concentrations at hotspots from Office of Committee 33/Hatfield Consultants. We encourage you to explore the following maps using Google Earth. To use this mapping tool, you will need to download a file that will open on your own computer using Google Earth. There you will find an interactive map like the maps below, where you can learn about specific locations by zooming in and clicking for more information. The Google Earth-based tool was developed by the War Legacies Project. 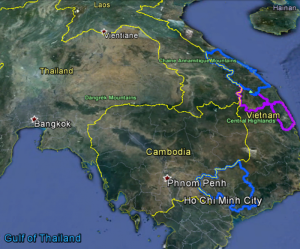 Google Earth image of heavily sprayed provinces in Vietnam (outlined in blue and purple). Dioxin hotspots become visible on the map by using Google Earth to zoom in on provinces. Google Earth image of the Da Nang Airbase (outlined in red above) in central Vietnam. 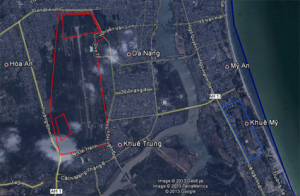 One of the two principal dioxin hotspots is located inside the Da Nang Airbase. 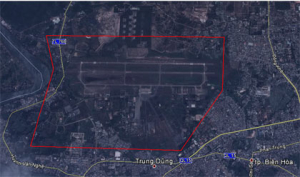 Google Earth image of the Bien Hoa Airbase (outlined in red above) in Bien Hoa city 50 kms. north of Ho Chi Minh City. This is the second principal dioxin hotspot; it is located at the Bien Hoa Airbase. Office of Committee 33/ Hatfield Consultants studies have confirmed that these two hotspots have dioxin contaminated soils and sediments above or near the Vietnamese National Standard of 1,000 ppt TEQ for soil and 150 ppt TEQ for pond sediments. Google Earth image of central Vietnam. The Phu Cat Airbase, located in Binh Dinh province (red dot in lower right above) was also used as a base for Agent Orange spraying. In 2012 the Vietnamese Ministry of Defense & the UNDP/Global Environmental Facility (GEF) completed the containment of dioxin and Phu Cat has been removed from the list of dioxin hotspots. 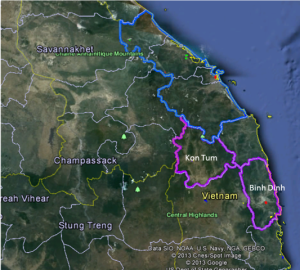 Two heavily sprayed provinces—Binh Dinh and Kon Tum—are outlined in purple (above). Setting Priorities: Addressing the Heavily Sprayed AreasTwelve provinces were the most heavily sprayed with Agent Orange during the war. Ten of them cluster around one of the three air bases that became the most contaminate with dioxin: Da Nang, Phu Cat and Bien Hoa. Today these ten provinces are home to over 12 million Vietnamese. These provinces need assistance for individuals and families burdened with disabilities and to restore forest cover and the productivity of farming soils in ways that create jobs and lead to higher incomes. See Dialogue Group: Second Year Report, pages 9-19. A public private partnership (PPP) is being used to address the human needs in Cam Le District in Da Nang. The PPP has enrolled all of the 165 children with disabilities in Cam Le District in the Hope System of Care and 17 of the 120 young adults. One of the children in the Hope System of Care is Nguyen Thi Ly, born in 2001 with a deformed face, head and chest. Ly’s grandfather was a soldier stationed in Quang Binh during the war. His two daughters, Ly’s mother and her sister, are disabled. Ly’s father is a bricklayer. The Hope System of Care has provided nutritional supplements and a scholarship for Ly, a new roof for the family’s house and a small loan to Ly’s mother to raise pigs. The photo below shows Ly at school. The Da Nang airbase was a major Ranch Hand facility during the American War in Vietnam. Nearly 11 million liters of Agent Orange were handled on the base. Today, several areas on the Da Nang Base including the loading, storage and mixing areas and Sen Lake to the north and the Pacer Ivy area at the south of the base have been confirmed to have high levels of dioxin. Levels of dioxin have been found to be as much as 365,000 ppt TEQ, more than 365 times the Vietnamese standard for soil. In a joint US-Vietnam project funded by USAID and the Ministry of Defense, 72,900 cubic meters of soil and sediment will be decontaminated using in-pile thermal desorption technology. The contaminated soil and sediment will be placed in a closed structure which is being built at the airbase. The soil and sediment will be heated to a minimum of 335 degrees Celsius (635 degrees Fahrenheit) and held at that temperature for 28 days to break the dioxin into non-toxic compounds. The project was officially launched on August 9, 2012 and is expected to be finished in 2016. The Bien Hoa Airbase is also a priority hotspot. Over the last decade, scientists from the government of Vietnam working with international experts have identified soils contaminated with dioxin. In early 2013 the Ministry of Defense and USAID will begin more detailed studies leading to the full remediation of the contaminated soils over the next several years. Dioxin is toxic to human health and exposure to it has been associated with numerous specific disabilities. Highly contaminated soil from the former storage area has been contained in a landfill, however there are other sites on the base (including lakes) that are in need of clean-up. Over 3.5 million liters of Agent Orange were located on the Phu Cat base during the American war in Vietnam. Several areas of the Phu Cat base were found to have elevated levels of dioxin requiring remediation (above 1000 ppt in soil or 150 ppt in sediment). The Ministry of Defense and UNDP/Global Environmental Facility (GEF) removed the 7,000 cubic meters of dioxin contaminated sediment and soil on the base and placed it in a secure landfill. The Government of Vietnam has now removed Phu Cat from the list of dioxin hot spots. Learn more about the ongoing cleanup and the important impact of government and donor support in the USAID Cleanup Progress Reports.